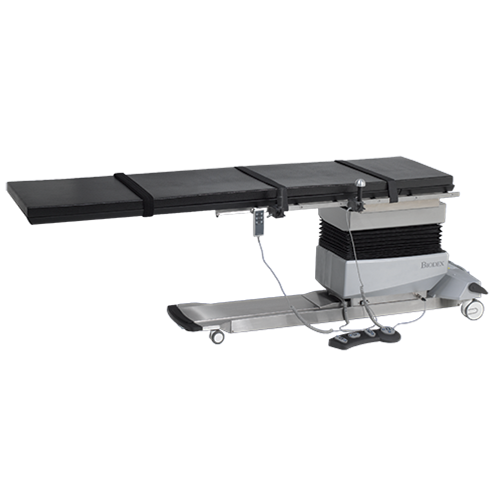 The Biodex 840 Surgical C-Arm Table has an extra-large, 71” radiolucent area, free-float X-Y tabletop, motorized control of height, isocentric lateral roll, Trendelenburg motions and the catheter tray extension make the Surgical C-Arm Table - 840 ideal for cardiovascular procedures. The radiolucent area is free of cross members, allowing full fluoroscopic visualization and unobstructed C-Arm positioning. Free-float tabletop with specially-designed SmoothGlide movement. Expansive head-to-toe tabletop motion, 35”. High-speed actuators assure quick tabletop positioning, height adjustability, isocentric lateral roll and Trendelenburg motions. Isocentric lateral roll maintains image center during tabletop movement, minimizing image distortion. Soma Technology, Inc offers a wide range of Surgical Tables. If you have any questions about any of our Surgical Tables or need a quick quote, call 1-800-GET-SOMA and one of our knowledgeable sales representatives will help you.